200th Surplus Product Added to multicomstore.com! Home / News / Uncategorized / 200th Surplus Product Added to multicomstore.com! 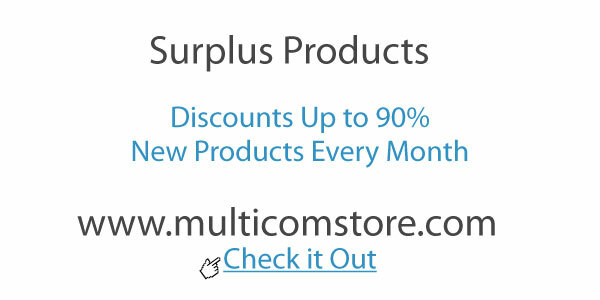 In addition to the 100s of quality products on Multicom’s Online Store – multicomstore.com – Multicom has recently added its 200th Surplus Product to the inventory. At the beginning of every month, Multicom’s President and CEO Sherman Miller hand-picks each new product that is deep-discounted at savings up to 90% off regular pricing. These products are highlighted on the multicomstore.com’s homepage. Where else can you find products like an Eagle Aspen Splitter (2 Way, 1 Port Passing, 5-2600 MHz) for $0.12, a Blonder Tongue Directional Coupler (ZDC-20, Indoor, 20 db) for $0.15, or Steren’s 6 FT. RCA-RCA RG59 Coaxial Cable for a mere $0.23? Additionally, there are high-end products like Blonder Tongue’s BAVM-860SAW Channelized Modulator, Channel Master’s CM-7001 Antenna Tuner, Drake Modulators, Linksys Routers and Coax Cable – all available at incredible discounts – and many products include free shipping. These products are priced to sell and quantities are limited. You have to see to believe. Check it out!